As a leadership and strategy expert, I am often asked what are the "tricks" to leadership. How can I improve my junior leaders and sharpen the skills of my senior leaders? John is a talented speaker and he tailored his presentation specifically to our group. I would highly recommend him to anyone looking for a speaker that is not only able to speak on a multitude of leadership topics, but can provide actionable skills and tactics. John is a leader among leaders. His even temperament, wisdom, excellent people skills and capacity for problem-solving render him an immense asset to any organization fortunate to have him on their team. I want to say thank you again for coming and sharing "The DNA of Power: Professionalism!" This workshop I believe sparked and set ablaze what it mean to be professional and gave practical tools for each man to understand Personal Power; best part about it is that it only costs a DIME! Thank you my friend and I look forward to our future chats and meetings! Excellent training with modern insights relating to cultural diversity for public safety professionals. Colonel Freeman of BAF Security Solutions and Colonel Boggs of Fortitude Consulting provided us with relevant, unique insights and experience that made my deputies re-think the way they handle encounters. Remarkable facilitation by the instructors and I highly recommend this 21st Century Strategic LE Series. Having Col. Boggs speak about leadership, to all levels of management, in a straight forward and effective manner was an invaluable experience for all in attendance. Quite frankly, we received excellent feedback and it is safe to say he was one highest rated keynote speakers we have ever had. In the relatively short time allotted, John did an excellent job of presenting his case and kept a tough audience of commercial real estate professionals enthralled. Everyone I spoke with after the event had praise for John's message and delivery, and also actionable takeaways for themselves and their associates. The fortitude to teach. The fortitude to inspire. The fortitude to collaborate. The fortitude to examine without bias. The fortitude to question. The fortitude to be curious. The fortitude to say what needs to be said. John Boggs has all of that and more. I wanted to thank you for presenting at the Boma luncheon yesterday and tell you that I really enjoyed your presentation. Hi energy, funny and to the point. I loved the analogy of the pigeon and the eagle! John Boggs is not only a leader, but he is a coach and role model. 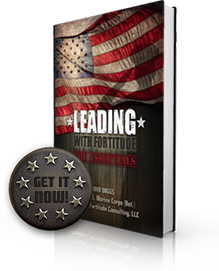 He possesses the emotional intelligence, leadership, and empathy required of 21st Century leaders. In a world full of legal, ethical, and leadership challenges, men like John are exactly what an organization needs, whether as a leader or consultant. What really makes John special...unique...is that as the team works towards the deadline, he is right there in the trenches slugging it out, getting the job done. Inspiring, motivating and leading...no task too large or small for John as he is always engaged. John's extensive knowledge of and facility with a wide variety of topics captures the attention; his teaching ability and expert communications skills allow him to reach people at all levels; his obvious honesty, candor and ability to entertain keep all within hearing distance enthralled. John is an exciting and dynamic individual. He is a "Top Notch" professional and conduct his Leadership Training sessions with a lot of energy and passion. Col. John Boggs has been an absolutely amazing executive coach for me. I certainly consider him a trusted advisor as he is extremely thoughtful and strategic as it relates to the action plan he worked with me to create for my aspirations to one day become a CEO. With out a doubt I would highly recommend John, as he is 5 Star Executive Coach indeed! Col John Boggs is a rare find. He is a virtuoso at helping senior executives develop into strategic leaders and equally adept at developing midlevel managers — making both groups strong in strategy development and task execution. The Course was an excellent opportunity to exchange ideas with fellow students and made us focus on the changes caused by events of the past decade. (The Course) Provided tools an got us thinking about the ideas on how we can build the trust in our Communities and our Departments. It proves to me the belief, passion and commitment you both have to the message of 21st Century Policing.